Corresponding sides are proportional. That is, the ratios of the corresponding sides are equal. For example, consider the following squares. Thus the squares are similar figures as their corresponding sides are proportional and their corresponding angles are equal. Each side of figure PQRS has been multiplied by 2 to obtain the sides of figure ABCD. The number 2 is called the scale factor. Similar figures are equiangular (i.e. the corresponding angles of similar figures are equal). Similar triangles can be applied to solve real world problems. For example, similar triangles can be used to find the height of a building, the width of a river, the height of a tree etc. Find the value of x in the following pair of triangles. Corresponding angles are marked in the same way in diagrams. Find the value of the pronumeral in the following diagram. Find the value of the height, h m, in the following diagram at which the tennis ball must be hit so that it will just pass over the net and land 6 metres away from the base of the net. So, the height at which the ball should be hit is 2.7 m.
Adam looks in a mirror and sees the top of a building. His eyes are 1.25 m above ground level, as shown in the following diagram. If Adam is 1.5 m from the mirror and 181.5 m from the base of the building, how high is the building? So, the height of the building is 150 m.
a. Equal angles are marked in the same way in diagrams. two pairs of corresponding sides are in the same ratio and the angle included between the sides is the same for both triangles. the corresponding sides are in the same ratio. the corresponding angles are the same. 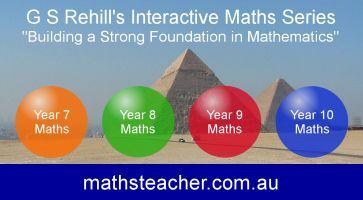 Copyright © 2000-2019 mathsteacher.com Pty Ltd. All rights reserved. Please read the Terms and Conditions of Use of this Website and our Privacy and Other Policies. If you experience difficulties when using this Website, tell us through the feedback form or by phoning the contact telephone number.